19↑ Peggy Gou - Moment E.P. 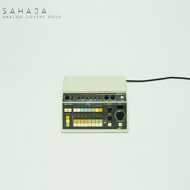 The debut album from LA underground producer/DJ/musician Sahaja, draws influences from his expansive vinyl collection of disco, afrobeat, brazilian, R&B, psyche, and rare new age music, but made almost exclusively with analog synthesizers + vintage drum machines in the Joshua Tree desert. Known for rocking parties as a DJ for years, he's played at legendary Los Angeles parties at Firecracker, The Do-Over, and Sketchbook, and he has shared the tables with everyone from DJ Spinna to Theo Parrish to The Gaslamp Killer.